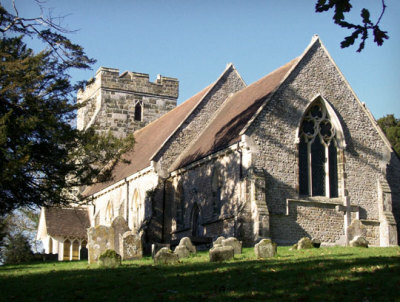 A Neighbourhood Plan - Is it for Crowhurst? 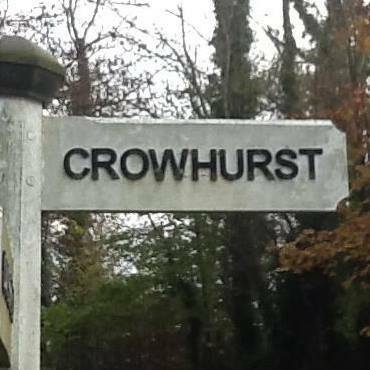 How might a Neighbourhood Plan help us decide about housing developments in Crowhurst ? plan we can have a say in where they go and what type and style of house we get! Where do you think future development sites could or should be – big or small ? landowners come up with other options for us? traffic improvements and other ideas could all be part of our plan. What do you think might be best for Crowhurst ? Is a Neighbourhood Plan the same as our Village Action Plan ? No! 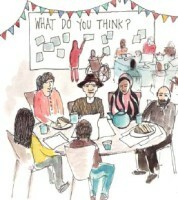 It gives everyone (young and older), an opportunity to talk together, develop ideas, share skills and share planning. The process of creating a neighbourhood plan requires everyone to be consulted and needs to be supported by the Parish Council. The neighbourhood plan will only be adopted if there is a 50% or more Yes vote for the final version in a referendum (ie. If 50% of those who vote say yes, the Plan will be “adopted” by Rother District Council). Rother has a duty to support us to create our neighbourhood plan, which once approved, becomes a legal document. This means that it must be considered alongside other government/local policies when Planning Permission is sought. What will be the impact on flood risks, local traffic car parking or amenities ? The village could decide what our priorities are, rather than Rother or developers, although this must fit within the wider Rother District Plan. Are there financial benefits in having our own Neighbourhood Plan ? developers by Rother, comes to the village for projects. Without a neighbourhood plan, Rother gets to decide where a lower percentage (15%) of the money goes. A neighbourhood plan takes work, time and money to put together. There is a grant to help buy in expertise. Most importantly, local skills and expertise play the largest part. The effort that is needed to create a neighbourhood plan could really bring our community together and give us a strong say in future changes in the Village. Come to one of our monthly meetings. 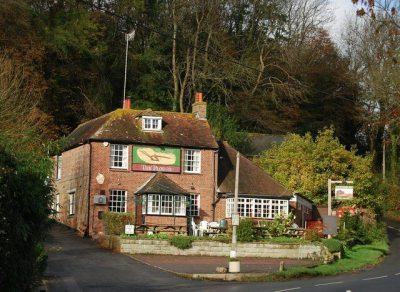 See our website, Crowhurst News or posters about the Village for dates. Join our email list to get updates and information. There is also a folder at The Plough Inn that has information, and minutes of meetings, for the Neighbourhood Plan. The diagram below shows how the Neighbourhood Plan Process will work and how the various components interact with each other. (The complete Terms of Reference for Crowhurst Neighbourhood Planning can be accessed fron the Policies and FAQs page of this website). 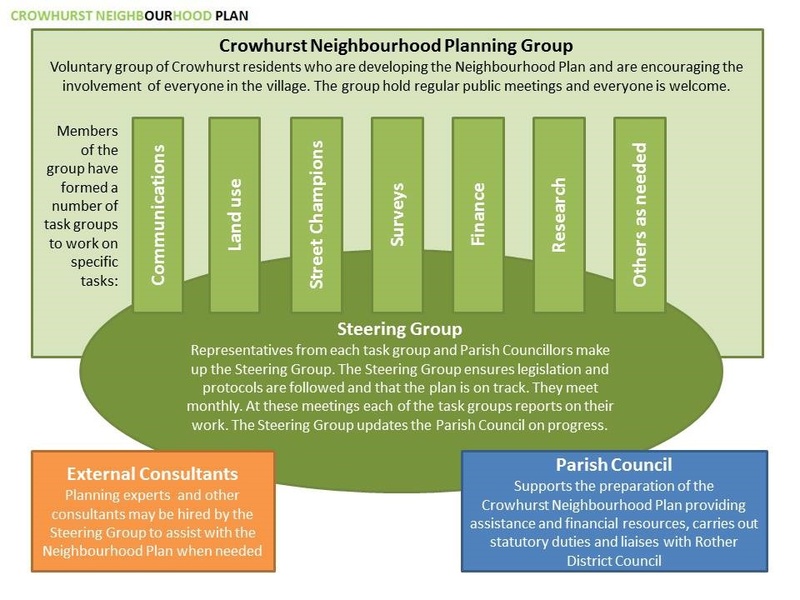 The diagram below shows the schedule of events that contribute to the process of creating a neighbourhood plan for Crowhurst. IF YOU WOULD LIKE TO SEE THE DETAILED TIMELINE AND PROJECT PLAN YOU CAN DOWLOAD IT HERE. To leave the mailing list at any time just send us an email with UNSUBSCRIBE in the title. Click here to read about the background of the Crowhurst Plan and why we need it. The Minutes from the Neighbourhood Plan Steering Group meetings are very important working documents. They are a monthly record of the process and progress of our Neighbourhood Plan. They provide easily accessible updates on what each of the Task Groups have been doing and how the village surveys and public responses are all feeding back into the process. If you need to know where we are with our Neighbourhood Plan then these minutes are essential reading. This is the Regulation 16 submission page of the Crowhurst Neighbourhood Development Plan (CNDP). The Reg 16 consultation took place between 7th Dec 2018 and 25th January 2019. This page will remain here for reference. Here you will find information, minutes and from all previous Neighbourhood Plan Meetings plus dates and agendas for the future. This is the Regulation 14 submission page of the Crowhurst Neighbourhood Development Plan (CNDP). It will remain here for reference and comparison with the submitted REG 16 plan. There are several task groups in which Crowhurst resident volunteers work on issues like communications, land use, heritage and the environment These groups will make a huge contribution to the final Neighbourhood Plan document. Towards the end of 2016 we met with staff and pupils at Crowhurst Primary School and Claverham. Their valuable and interesting views can be seen here on dedicated website page about our school visits. 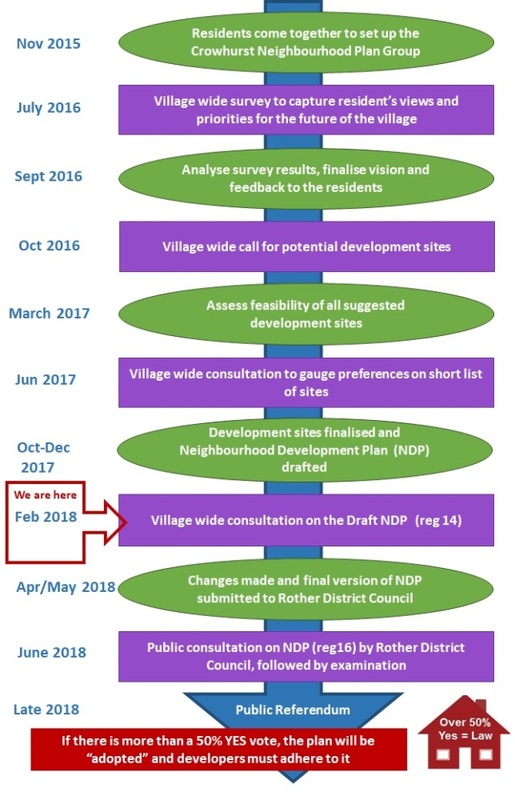 This page contains all documents relating to the Consultation Process including village survey results and longlisted and shortlisted sites feedback. It will be updated as the process continues. This page contains the legal stuff! Our policies, data protection information, terms of reference and frequently asked questions about the Neighbourhood Planning Process. This blog is mostly to enable you to engage directly with feedback, comments and questions. At this stage your feedback and engagement is absolutely vital. So if you are unable to attend the regular meetings in the village hall and need a place to comment then please do so here.